This magnificent mountain offers fantastic late season skiing on 3 aspects. If snow conditions allow, there are 2 runs that offer over 600m of descent when following snow filled stream lines, even when the rest of the hillside appears bare. None of the descent lines are particularly steep, but are in a great position. One of descents to the Lairig Ghru could be done to finish off the day, having earlier been down something steeper on Sgor an Lochain Uaine or in Garbh Coire Mór. The most logical approach is from Deeside, using bikes to Linn of Dee and then walk round to Corrour Bothy. Some will opt for approaching via Cairngorm and down Taillears Burn, but this involves a re-ascent to get back to the car at the end of the day. 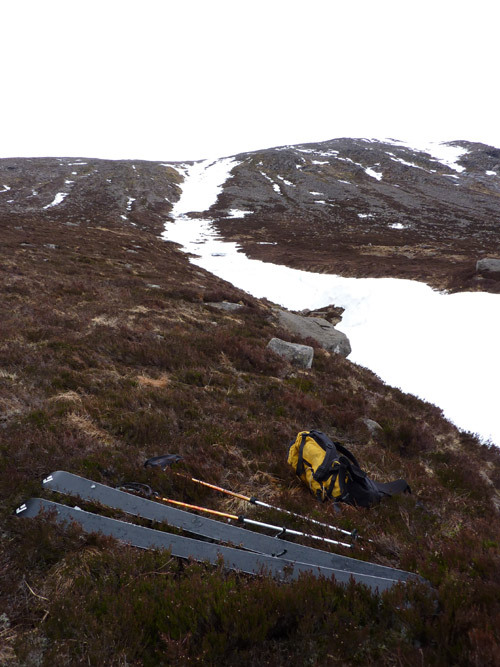 There are 2 Scottish Avalanche Information Service forecasts worth considering for Cairn Toul. A superb run down the south face, starting by the southern cairn on the summit ridge. The descent starts down a shallow corridor, before cutting across a small snow arete that allows access to the bowl of the corrie. If snow cover allows, then a direct line into the corrie would obviously be possible, but the line described persists late into the season, despite its southerly aspect. The southern main drainage line from the corrie often holds snow late into the season, offering a long descent low down into the Lairig Ghru. If this is present, then the overall descent can be in excess of 600m! Notes: Comparable to a resort black run in the upper section. If you are approaching from the south, and the hillside looks bare, persevere. The drainage line from the corrie is deep low down, and as such, holds snow well late into the season, sometimes lower than Taillears facing it. You have a choice of options from the summit ridge of Cairn Toul into Coire an t-Sabhail. From the southern end of the summit ridge, the steepest line into the corrie can be found. It can have boulders poking through the snow, so be aware of that. From the northern end of the summit ridge, the angle is easier, maybe equivalent to a red run. At the corrie lip, there is sometimes a break in the snow necessitating a very short walk, but it's worth it. As the snow steepens, the Lairig Ghru opens out below you, and you should see a strip of snow giving you a several hundred metre descent line. Be aware of substantial glide cracks, holes in the snow and in particular lower down, weak snow bridges. Although not at long as the other lines described on Cairn Toul, this descent takes you into one of the most beautiful corries in the Cairngorms. The face comprises of a number of shallow runnels, separated from each other by shallow rocky ridges. Your choice of descent on the day should be dictated by the snow cover. One of the runnels directly below the summit is the best one, with a relatively consistent gradient all the way down to the shallow ridge above the lochan. Set off from the cairn at the North end of the Cairn Toul summit ridge. After a few metres, you should be able to ski left around, and then below some rocks (effectively doing an about turn), bringing you into the runnel. The way down from there will be obvious. An alternative, depending upon snow cover, is to ski down the North ridge some way before dropping into a complete runnel. 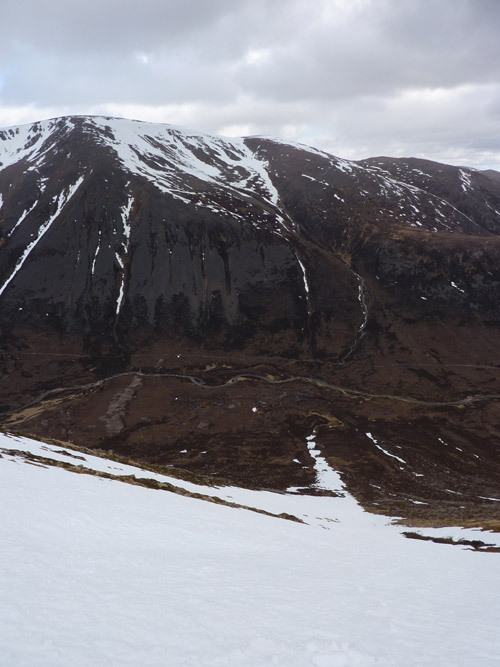 It is worth having a look at the face prior to skiing it to ensure you don't cut down the wrong runnel - those nearest the summit often have rocky sections. You can look across the face from the col between Sgor an Lochain Uaine and Cairn Toul to give you an idea of the snow cover. 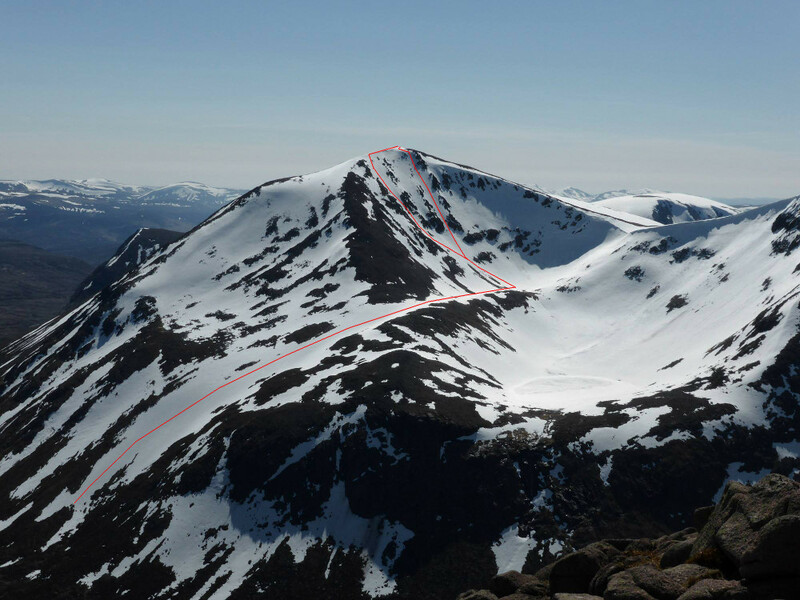 If you want to re-ascend Cairn Toul from the corrie, you can scramble up the scree covered North ridge of Cairn Toul, or find your way up to the col between it and Sgor an Lochain Uaine, where there is usually a break in the cornice. The striking Northeast ridge of Sgor an Lochain Uaine is a very good ascent, although be aware it can be a little tricky at the top. If you don't want to climb back out, you may be able to continue on down into the Lairig Ghru following the often present line of snow that sits in a channel below the face, bounded by a shallow ridge above the lochan. At the end of this channel, long lasting snowfields descend towards the Lairig Ghru. Notes: Only one narrow steeper section - comparable to a black run.